Sometimes our children are much better at being adults than, well, adults. Sure, they may have less on their minds — I can’t remember the last time a child had to pay the mortgage, worry about getting laid off, or do the taxes. And it’s not like they ever remember to feed the dog. But their passion surrounding issues of justice can be inspiring. 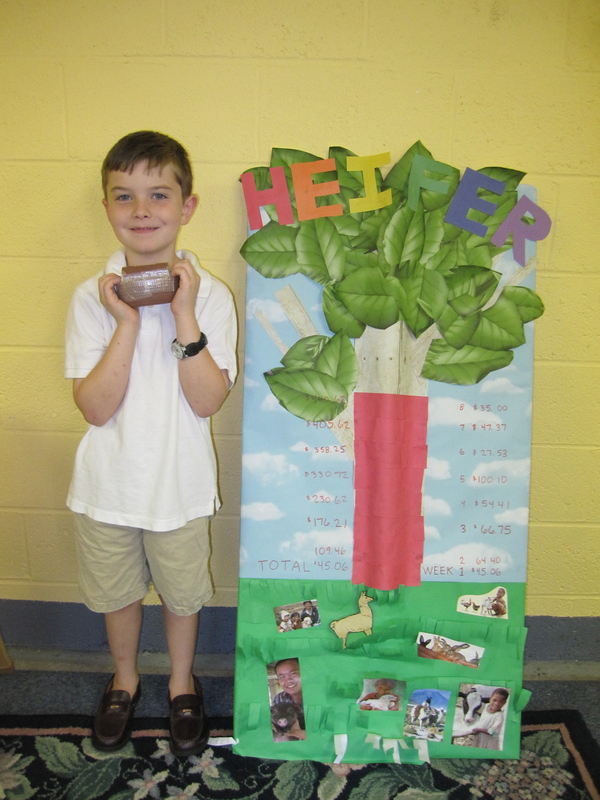 This summer, the children of St. John’s participated in “Animal Crackers,” a program sponsored by Heifer International to teach kids how animals can help eradicate global hunger. Each Sunday they learned about a different animal and how it could positively impact a family below the poverty line. Along the way they met some live animals including three chickens and a goat. I think the llama was sick on its appointed day. The children also raised $740; enough to purchase a cow ($500), a goat ($120) and a pig ($120) to help families in need. In addition to soliciting funds from parishioners after church (how could anyone possibly say no to a young child holding a blue bucket in the shape of a fish? ), some children got creative in their fundraising approaches. The three Hussey kids set up a lemonade stand on a Sunday afternoon and raised $20. And one youngster, seven-year-old William Buckley, single-handedly raised $105 over the summer. But mostly, I love William’s creativity, diligence, and passion. His response to hearing stories of people in need translates into action. And shouldn’t that be the goal of every Christian? We’ve been reading a lot from the Book of James both on Sunday mornings and in the Daily Office recently. I could think of no better illustration of the line “Be doers of the word and not merely hearers” (James 1:22) than William’s efforts. We should all be so inspired. Oh, and he’s our new stewardship chair. Wow! My favorite charity and my favorite hymn all in one post. Thank you endlessly. And you love stewardship campaigns as well (right??) so really I hit the trifecta. Thanks for this post – such a glowing example of children as ministers in their own right. Go William! Go God!! and Go to all those other faithful kiddos too!!! I hope William is successful in shaming all the adults. Who, in their right mind, will have the nerve to say “No” to him? His ideas certainly sound better than those of adults who constantly rely on the “tried and true” that are actually overused and unimaginative. Oh! You were just joshing, right? Right? I admit-he’s a great kid. He also has a great church family!